Cody McDonald completes move to Gillingham. 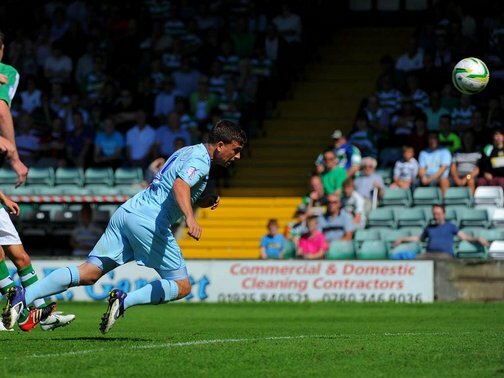 Cody McDonald has scored 8 goals in 47 games for Coventry City. Striker Cody McDonald has today completed a move to fellow League One side Gillingham. Earlier today, it was announced that a mutual termination of the remainder of his contract at Coventry City was agreed, and he has quickly found a new club. This will be McDonald’s third spell at The Gills, following two previous loan spells, including one at the end of last season. In total, McDonald made 47 appearances for Coventry City, scoring 8 times. Today Cody McDonald has passed a medical and signed a two year deal. Cody is a match winner, he scores goals and in his loan period, on and off the field, he conducts himself in the right way. He works hard and Mr Scally has worked for the last couple of months to get this deal done. Last time here he got 26 goals in one season and this time he will be looking for 30! – Martin Allen, Gillingham Football Club manager. « Calling all Coventry City fans – Sunday August 11th: protest at The Ricoh Arena.